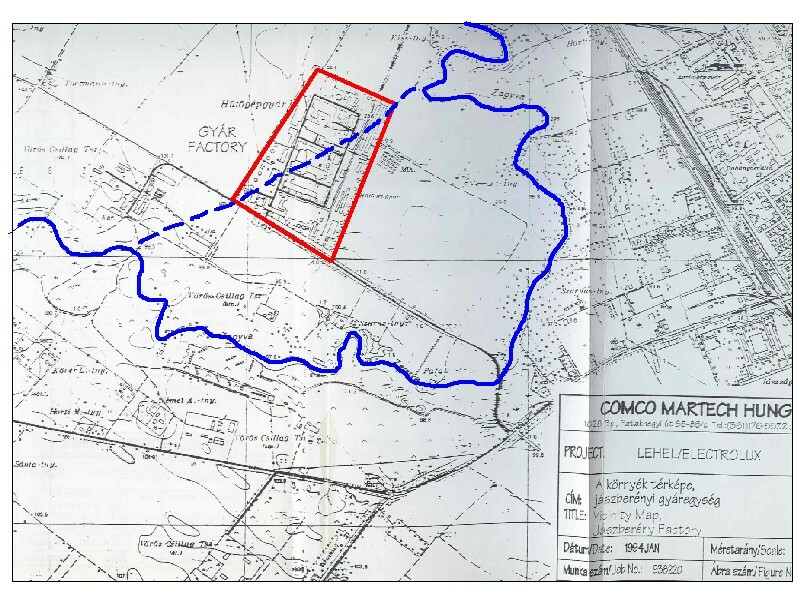 As Comco-Martech KFT's Characterization Group Manager for the Lehel Electrolux Project in Hungary, one of Mr. Deane's responsibilities, in addition to training junior multi-national geoscientists, was to continually re-evaluate and update multi-site hydrogeology as new data were produced during field activities. Following the dissolution of the Soviet Union in 1991, Electrolux (Sweden) purchased three existing Hungarian state-owned factories as part of the Hungarian privatization process. The main factory was located in Jaszbereny, while the two smaller factories were located in Jaszarokszallas and Jaszboldoghaza. The following discussion of the Jaszbereny factory hydrogeology is based on data generated up to January 1994. Please note that the interpretation of site hydrogeology may have been subsequently revised if new significant data have been generated since that date. The Jaszbereny factory is underlain by a six-aquifer groundwater system and is partially surrounded on three sides by the Zagyva River. The two shallowest aquifers, the "7-Meter Zone" and the "12-Meter Zone", demonstrated very interesting and unexpected groundwater elevation (flow) patterns with respect to regional groundwater flow conditions within the noted aquifers. Figure 1 (see link below) shows the location of the factory ("GYAR", outlined in red) and the current path of the Zagyva River (highlighted in blue). North is toward the top of this figure. The Zagyva River generally flows eastward, around the southern factory boundary, and then onward through Jaszbereny. 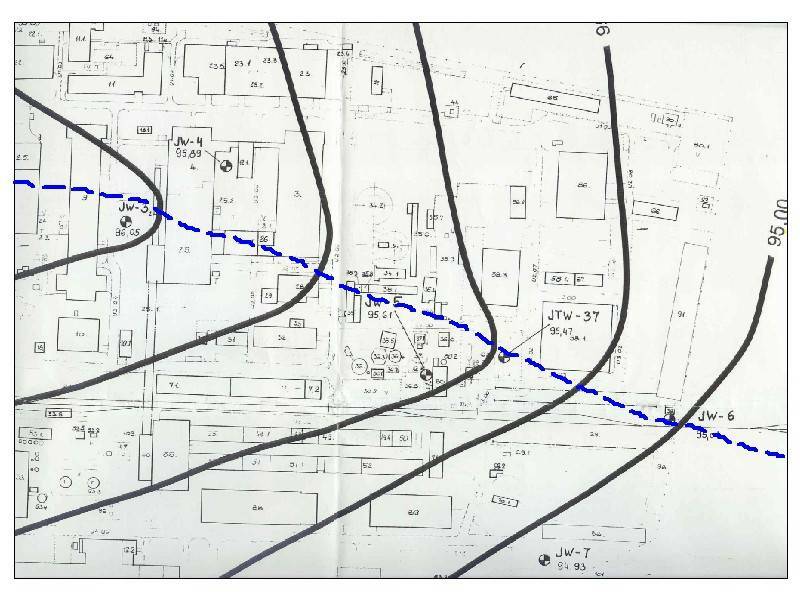 Local groundwater flow (not shown on Figure 1) within the 7-Meter and 12-Meter Zones north and south of the factory is generally eastward toward Jaszbereny. However, the eastward groundwater flow within both aquifers was locally redirected toward the northeast and southwest along a linear groundwater mound extending northeast across the factory (Figures 2 and 3). In both of these figures, north is generally from the lower left-hand corner toward the upper right-hand corner. 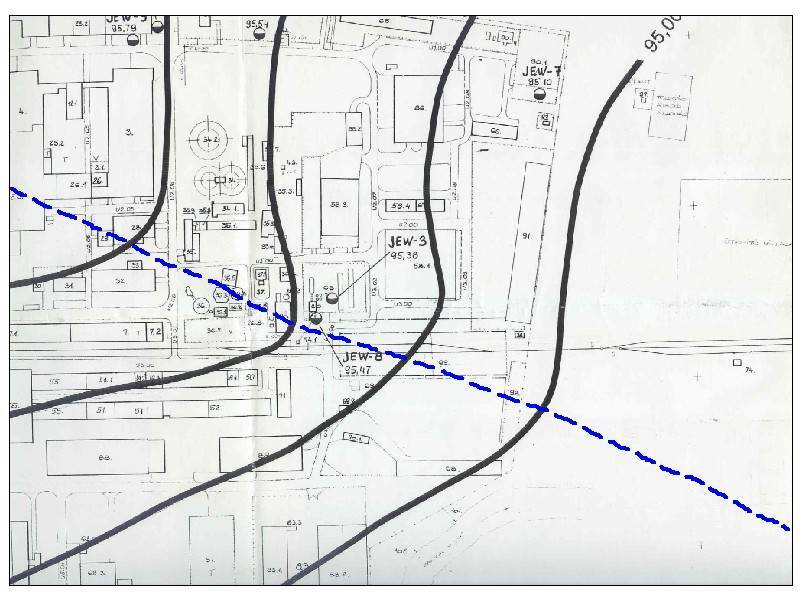 While canvassing the factory, Mr. Deane noticed a northeast-trending discharge ditch located within the extreme northeast portion of the factory, which was generally aligned with the noted linear groundwater mound. Mr. Deane suspected that this trench may represent a vestigial remnant of the old riverbed of the "ancestral" Zagyva River. After reviewing numerous groundwater monitoring well/soil boring logs and data generated during a prior cone-penetromer (CPT) survey of the entire factory, he developed new groundwater maps showing the lateral change in factory sediments comprising both the noted aquifers and the separating aquitard. It became apparent from these maps that the portion of the separating aquitard underlying the linear groundwater mound consisted of sands/gravels instead of the typical clays/silts that comprised the aquitard to either side of the mound. A subsequent exploratory drilling program focusing in part on the axis of the groundwater mound confirmed the lack of expected typical aquitard sediments beneath the groundwater mound. Therefore, a northeast-trending vertically-oriented "wall" of sands/gravels cutting through the noted aquitard appears to have been deposited by the ancestral Zagyva River, prior to its redirection around the southern factory boundary, providing a groundwater "short-cut" for a portion of the river surface water, between two separated reaches of the Zagyva River beneath the factory. Flow through this short-cut was significant enough to disrupt the eastward groundwater flow within the 7-Meter and 12-Meter Zones via a hydraulic pressure "overflow" of the buried "banks" of the Zagyva River paleochannel and then into the laterally adjacent portions of these aquifers, similar to overbank flood conditions that periodically occur on rivers, forming the groundwater contour "V"s. The dashed blue line shown in Figures 1 through 3 indicates the approximate location of the paleosediments (paleochannel) that were deposited by the ancestral Zagyva River, which lines up with the aforementioned trench and linear groundwater mound. The hydrodynamics of the short-cut are readily apparent, both laterally and vertically. Laterally, piezometric contour "V"s are tighter within both aquifers in the southwest portion (upper left-hand corner) of both Figures 2 and 3, which represents the "upstream" portion of the groundwater short-cut, nearest where Zagyva River water enters the short-cut. This can be expected because as groundwater is lost to the upstream portions of the aquifers, the energy decreases in the downstream direction of the groundwater short-cut, resulting in increased distances between and an opening of the groundwater contour "V"s. Similarly, this is also shown vertically when comparing the piezometry of both aquifers. For example, the 7-Meter Zone piezometry appears to be more disrupted, possibly because this aquifer is vertically closer to the groundwater short-cut hydraulic energy source, the Zagyva River. Conversely, the 12-Meter Zone piezometry appears to be less disrupted, possibly from most of the groundwater short-cutting (energy) having been siphoned off by the 7-Meter Zone. RESULT: The new conceptualization of groundwater flow beneath the Jaszbereny factory, consisting of the effects of the Zagyva River paleochannel on the vertically and hydraulically-connected portions of the six-aquifer groundwater system, allowed Electrolux to better understand groundwater contaminant flow beneath this factory and appropriately modify its remedialtion approach. Mr. Deane appreciates the opportunity to have worked with Mr. Jim Lenoci and the multi-national staff of Comco-Martech KFT, Budapest and Jaszbereny offices, Hungary. In particular, Mr. Deane thanks Mr. Kohler Artur for translating the noted document from the English to the Hungarian. Copyright © DEANE CONSULTING, INC. - all rights reserved.